Are you being told you need a price reduction to sell your home? It has been my experience that this is often the first solution recommended to home sellers after a home has sat on the market without receiving an offer. But is a price reduction really necessary? The short answer is "maybe," but there is a simple list of questions to first consider before you agree to a price reduction in order to sell your house. During the process of selling a home, it is possible that a price reduction might be needed to expose your home to the right set of buyers. But in my experience, most price reductions are recommended as the "easy way out" of the proper, daily marketing of a home for sale. To sell a home at its highest market value today, one must execute a very busy, daily marketing plan that requires a team of highly trained people. The days of listing a home in the Tallahassee MLS, putting a sign and lockbox on the property, and then sitting back and waiting for offers is over. Less than 50% of the homeowners who listed their home for sale in the past 365 days were successful in selling their homes, so don't for a second think that real estate agent (real estate company) selection is a trivial matter. Just think about it. Every single home that failed to sell was listed with a real estate company. We are not all alike! A survey by the National Association of REALTORs found that 64% of homeowners listed their home for sale with the first real estate agent with whom they interviewed, which I believe speaks to the lack of understanding by consumers of just how important it is to hire the right real estate company. 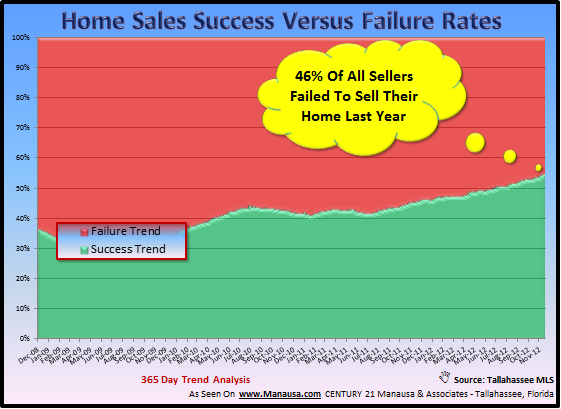 But the results above don't lie, more than half do not have a plan for success when selling a home. OK, so your home has been on the market for too long without an offer and your real estate agent is asking for a price reduction. What do you do? When you listed the home, you convinced me you could sell it at this price. What has changed since then? How much has the market appreciated/depreciated since the home was first listed? Have the agents and buyers who viewed the house told you they thought it was priced too high? How many people have viewed the home on your single property web page? How many people have visited the virtual tour of the home? What has happened to similar homes since the property was listed? Why is a price reduction the best solution for me and my family? If you work to find honest answers to these questions, you might just discover that the marketing of your home was not was you needed it to be. If you would like to know how our daily home marketing plan works without requiring a price reduction, then drop me a note and we can schedule a time to evaluate the saleability of your home.